India in an exciting test match with South Africa were able to secure a much needed draw to let series squared, thanks to some defiant show by Indian batsman who were able to stand till the stumps of last day. By this the series ended up in a 1-1 draw, ending their first series draw after losing previous four on the trot. 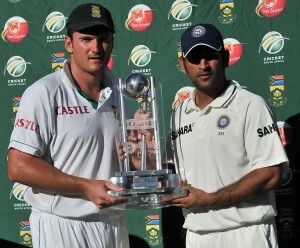 South Africa won the first Test by an innings and 25 runs before India squared the series with an 87-run win in Durban. After amazing century earlier by Kallis, followed by a half century from Boucher had put India in the backfoot in the battle to earn a series draw. India with a total of 340 to chase, started off little niggly, as Sehwag went early, the one who could have got India some flyer of start. Gautam Gambhir on the other hand was the symbol of defiance as he scored a very much needed 64 in the process. Dravid also provided resistance with his 31, hence shortening South Africa's chances for a series win. With Tendulkar who showed some walled resistance making just 14 of 91 balls. As South African bowlers battled hard, but failed until at 166-3 , there were shake hands between the captains and was called a day. VVS Laxman was also partnering Tendulkar at 32. "I'm playing as well as I've ever played. I've worked on my game for the last three to four years, tried to up my scoring rate and hopefully there are a lot more runs to come in the years ahead." "It was a terrific series," said South Africa captain Graeme Smith. "It was very competitive. Every day and every session were really good. The teams are very even and that shows in how competitive the cricket is." "It was a very interesting series and it's good to come from behind," said India captain Mahendra Singh Dhoni. "The batsmen did their job and the bowlers did really well in Durban. At the end of the day we will be happy with our performance." Next coming would be one T20I match on Sunday, and five one day m atches. Changes expected to take in the squad would include Pakistan Born Imran Tahir , who makes into 14 man squad,whereas Francois du Plessis is to replace injured Kallis.